The Kindle Fire is currently sold out at Amazon, which adds even more fodder to the concept a new version is arriving next week. There is an Amazon press event scheduled for next week, but there has been no clues as of yet what the subject matter will be. We’ve seen a new Kindle Fire pass through the FCC, and propaganda-style posters have gone up in Amazon offices telling employees to keep quiet, but still the clues are few and far between. Unless of course you pay attention to what is and isn’t in stock on Amazon itself. We saw the Kindle Touch go out of stock earlier this week, and now the Kindle Fire is only available from third-party sellers. With the holiday shopping season almost upon us, that seems like an odd time for such a hot item last year go out of stock, unless of course its successor is just about to drop on us. It’s looking more and more likely that we will indeed be seeing new Kindles at this upcoming media event, and TechnoBuffalo will be there to bring you all of the coverage. SEATTLE–(BUSINESS WIRE)–Aug. 30, 2012– (NASDAQ:AMZN)—Less than one year ago,Amazonintroduced Kindle Fire—combining 15 years of innovation into a single, fully-integrated, end-to-end service for customers. 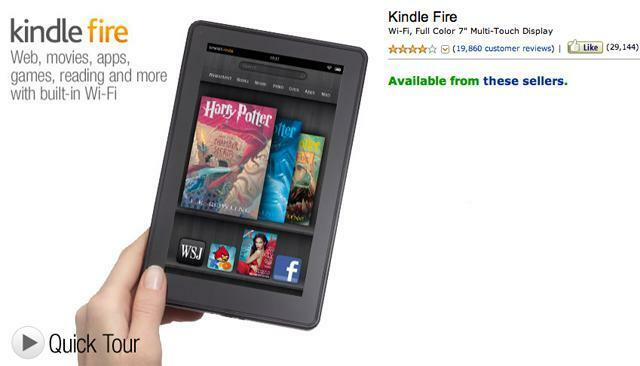 Kindle Fire quickly became the most successful product launch in the history ofAmazon.com, earning over 10,000 5-star customer reviews, and is the #1 best-selling product across the millions of items available onAmazonsince its introduction 48 weeks ago. Today,Amazonannounced that Kindle Fire is sold out, and that in just nine months, Kindle Fire has captured 22% of tablet sales in the U.S.